The Orthodox Church traces its history back to the original Church founded by our Lord Jesus Christ. It is the Church of the apostles, of the martyrs, and of the early Christians. Orthodoxía (Orthodoxy) is a Greek word meaning “correct praise” or “correct teaching” and the Orthodox Church is the bearer of ancient Christian Tradition. Monasticism itself arose out of this spiritual fervor and devotion of the early Christian Church. The monastic life has always been an honored path for men and women to “deny themselves, take up their cross” and follow the Lord by devoting their lives to Him and becoming monks or nuns. (cf. Matthew 16:24). Taking vows of personal poverty, chastity, obedience, and stability, they seek spiritual perfection by leading lives pleasing to Christ. In their imperfect way, they strive to serve Him with a three-fold service of prayer, work, and study. The word for monastic (i.e. a monk or nun) comes from the Greek word monos, which means “single” or “alone”—one who chooses to work out his salvation alone with God instead of within a family. Monastics live continuously in the presence of God and struggle to maintain communion with God in Jesus Christ. They strive for a life of unceasing prayer, fasting, self-denial, chastity, vigilance, love, and humility in order to unite their entire being—heart, soul, and mind—with God. They lead a life of obedience to God through willing obedience to their Abbot or Abbess. Orthodox monastics make a lifelong commitment to their monastery. Through a secluded, God-centered life, they work and pray for the salvation of all humankind. Seeking spiritual perfection instead of the pleasures of this world, they lead lives of solitary prayer and repentance. They are a wellspring of spiritual guidance and renewal for the faithful. 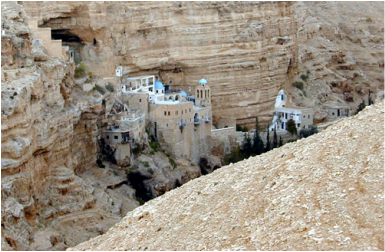 Isolated from secular society, monasteries maintain Orthodox Christianity in its purest form. Tomorrow you will be seeing something strange and unfamiliar to most of you, because monasticism is for the most part not part of the Protestant tradition. But this evening I hope to share some insights with you and open your eyes to certain passages of Scripture that may help you to appreciate monasticism and its purpose. Although monasticism is often said to have emerged in the third and fourth centuries after Christ, I intend to demonstrate lucidly to you—solely from the Scriptures thmselves—that monastic ideals and the monastic life have (in some form or other) always played a vital rôle in Christianity from its very beginning and inception. So why do Church historians often credit St. Anthony the Great, who lived from the mid-third to the mid-fourth century, with being the "Father of monasticism"? Because with him and his times monasticism moved out of the cities into the solitude of the desert and wilderness—after the peace of Constantine, at a time when the Roman persecutions were subsiding, when Christianity was at long last being legalized, at a time when worldly, lukewarm and opportunistic people were flooding into the Church to gain the favor of the Roman Empire's new Christian emperors. Feeling the new secular influences and witnessing a sort of "watering-down" of the former fervent zeal of the persecuted Church, many zealous and devout Christian men and women fled to the solitude of the desert and the wilderness to "work out [their own] salvation with fear and trembling" (Phil. 2:12). With St. Anthony and his disciples and the succeeding generations, monasticism became a sort of "protest movement" in pursuit of perfection. Its adherents sought to follow Christ by heeding his call to put the precepts of the Gospel into actual practice. St. Anthony was the father of eremitic monasticism, as his disciples mushroomed into communities of hut-dwelling hermits springing up in the deserts of Egypt, Palestine and elsewhere, as the movement spread throughout the Empire and beyond. St. Pachomius, who also lived in Egypt, became the father of cenobitic monasticism, where he organized communities of monks and nuns within huge walled compounds closer to populated areas, where the monks or nuns followed a rule under the spiritual guidance of their abbot or abbess. In this way he provided a way for zealous Christian men and women to sell everything, to give up the world, their possessions, their relatives, the hope of worldly fame, glory and honors, and the ability to perpetuate and recreate themselves in flesh and blood—and enter a monastery or convent. There, under vows of personal poverty, chastity, obedience, and stability, they sought to live a life in Christ "free from all worldly concern" as St. Paul had exhorted them to do. Their life was one of prayer and physical labor. St. Basil the Great of Cappadocia in Asia Minor added a third ingredient to the monastic life by including theological study among the activities of the monastics who followed his Rule. Thus the monastic life evolved into a trinity of activities in its service to God: prayer, work, and study. Safe in their holy habitation and protected from the outside world by monastery walls, they set their hope on Christ like Saint Paul the Apostle: "as unknown, and yet well known; as dying, and behold we live; as chastened, and yet not killed; as sorrowful, yet always rejoicing; as poor, yet making many rich; as having nothing, yet possessing all things" (2 Cor. 6:9-10). For as individuals they owned nothing; but held all things in common like the early Christians. In the Typikon or Rule that he compiled for his monks in the late twelfth century, Saint Sava of Serbia wrote: "Let those thrice-accursed words ‘mine’ and ‘thine’ be banished from among you." In the monastic cycle monks and nuns join the psalmist David in praying together liturgically throughout the day and night seven times (Ps. 119:164). As they go about their daily obediences of physical labor, they try to keep St. Paul’s injunction "to pray without ceasing" (cf. I Thess. 5:17), by contemplatively reciting the "Jesus Prayer": "Lord Jesus Christ, Son of God, have mercy on me, a sinner" (cf. Luke 18:13). ‘Not everyone who says to Me, "Lord, Lord," will enter the kingdom of heaven, but he who does the will of My Father who is in heaven’ (Matt. 8:21). ‘Unless your righteousness surpasses that of the scribes and Pharisees, you shall not enter the kingdom of heaven’ (Matt. 5:20). ‘Therefore you must be perfect, even as your heavenly Father is perfect’ (Matt. 5:48). Surely none of us here this evening would be so stupid as to believe that he or she had never failed to do the will of our Father who is in heaven, nor would any of us dare to be so foolish as to claim to be perfect, "even as our heavenly Father is perfect." ‘If you would be perfect, go and sell your possessions and give to the poor and you shall have treasure in heaven and come, follow Me’ (Matt. 19:21). ‘So therefore, no one of you can be My disciple who does not give up all his possessions’ (Luke 14:33) .... ‘Sell your possessions and give to charity; make yourselves purses which do not wear out, an unfailing treasure in heaven.... For where your treasure is, there will your heart be also’ (Luke 12:33-34). And they were continually devoting themselves to the apostles’ teaching and to fellowship, to the breaking of the bread and to prayer. And everyone kept feeling a sense of awe ... and all those who had believed were together and held all things in common; and they began selling their property and possessions, and were sharing them with all (Acts 2:42-45) .... And the congregation of those who believed were of one heart and soul; and not one of them claimed that anything belonging to him was his own; but all things were common property to them (Acts 4:32). Do we, who call ourselves Christians, still do this today? Do we, who so casually consider ourselves to be followers of Christ, keep His holy commandments as faithfully as the early Christians did? And since most of us must admit that the answer is that we do not, we must ask ourselves why not. Perhaps the fervent, altruistic zeal of the early Christians can in part be ascribed to their anticipation of the imminent return of the Messiah, which they expected to take place at any day. It later became evident that the Lord might not return as soon as some had expected. Moreover the responsibilities of marriage and the raising of children prevented most Christians from keeping this "vow of poverty" commanded by Christ. Even so zealous an apostle as the celibate Saint Paul deemed it necessary to admonish his married brethren: "If anyone does not provide for his own, and especially for those of his household, he has denied the faith and is worse than an unbeliever" (1 Tim. 5:8). Yet surely, many devout Christians must have asked themselves then, even as we do today: Have we in reality demurred and declined to obey our Lord, like the rich young man who "went away sorrowful, for he was very rich" (Matt. 19:22)? Are our ears not haunted, as his must have been, by those disturbing words our Lord spoke to His disciples: "It is easier for a camel to go through the eye of a needle than for a man with many possessions to be saved" (Matt. 19:25). Do we not share the astonishment of the disciples who first heard these words, and do we not respond with the same tremulous question as they: "Who then can be saved?" (Matt. 19:25). Then Peter asked Jesus: ‘Behold we have left everything and followed You, what then will there be for us?’ And Jesus answered: ‘... You who have followed Me ... and everyone who has given up houses or brothers or sisters or father or mother or wife or children or farms for My Name’s sake, shall receive many times as much and shall inherit eternal life’ (Matt. 19:27-29). ‘I wish that all men were even as I myself am. However, each man has his own gift from God, one in this manner and another in that. But I say to the unmarried and to widows that it is good for them if they remain even as I’ (1 Cor. 7:7-8). ‘I want you to be free from concern. One who is unmarried is concerned about the things of the Lord, how he may please the Lord; but one who is married is concerned about the things of this world, how he may please his spouse’ (1 Cor. 7:32-33). ‘Not all men can accept this statement, but only those to whom it has been given. For there are eunuchs who were born that way from their mother’s womb, and there are eunuchs who were made eunuchs by men, and there are eunuchs who have made themselves eunuchs for the sake of the kingdom of heaven. He who is able to accept this, let him accept it’ (Matt. 19:10-12). immediately the Spirit drove Him into the wilderness. And He was there in the wilderness forty days, tempted by Satan, and was with the wild beasts; and the angels ministered to Him (Mark 1:12-13). She was advanced in years, having lived with her husband seven years after her marriage and then as a widow to the age of 84. And she never left the temple, serving night and day with fastings and prayers. If she had married at the age of 15, which would have been quite normal in ancient times, she would have been widowed at the age of 22 and served God in the Temple for 62 years "night and day with fastings and prayers." And what color of raiment do you suppose she would have worn in her widowhood other than black? For this has been the custom up to the present day in the Eastern Mediterranean, where it is not at all uncommon for widows to wear black for the rest of their lives. Hence the "widows and virgins" so frequently mentioned in the New Testament and in early Christian sources were in actuality a sort of monastic ministry—the first nuns. St. Paul describes this way of serving God in his first letter to Timothy [5:5]: "Now she who is a widow indeed, and who has been left alone, has fixed her hope on God and continues in entreaties day and night"—very like the prophetess Anna. ‘Do not let a widow under sixty years old be enrolled, and having been the wife of one man, having a reputation for good works: if she has brought up children, if she has lodged strangers, if she has washed the saints’ feet, if she has relieved the afflicted, if she has diligently followed every good work. But refuse the younger widows; for when they have begun to grow wanton against Christ, they desire to marry, having condemnation because they have set aside their previous pledge. And besides they learn to be idle, wandering about from house to house, and not only idle but also gossips and busybodies, saying things which they ought not. Therefore I desire that the younger widows marry, bear children, manage the house, giving no opportunity to the adversary to speak reproachfully.’ (I Tim. 5: 9-14). These requirements sound more like prerequisites for taking a vow of celibacy to serve Christ in a special ministry, rather than merely being placed on the "welfare rolls" of the early Church. The "widows and virgins" were the "nuns" of the New Testament and the early Church, living together as a sisterhood and actively serving Christ in the urban settings of their local churches. This is not to say that serving Christ in the married state is any less honorable. Both paths are blessed by God. I am merely pointing out that the monastic vocation is a valid way for a Christian to serve our Lord and has been so from the very beginning. Perhaps the best way to illustrate how the two paths compliment each other in a symbiotic service to God is to remember the story of the two sisters of Lazarus, Mary and Martha, who each served God in her own way—with Martha symbolizing service to God in the world and Mary as service to God in the monastic life of contemplation. ... A certain woman named Martha welcomed [Jesus] into her house. And she had a sister called Mary, who also sat at Jesus’ feet and heard His word. But Martha was distracted with much serving, and she approached Him and said. ‘Lord, do You not care that my sister has left me to serve alone? Therefore tell her to help me.’ And Jesus answered and said to her, ‘Martha, Martha, you are worried and troubled about many things. But one thing is needed, and Mary has chosen that good part, which will not be taken away from her.’ (Luke 10:38-42). Surely this is the "one thing needed" and "that good part" chosen by Mary, and our Lord promised that it "shall not be taken away from her." The monastic vocation is a calling for zealous Christians to offer up their lives as a sacrifice on the frontiers of paradise as a sweet aroma, well-pleasing to God. It is a way for one to join the Apostle Paul in saying: "I have been crucified with Christ" (Gal. 2:20); and again: "The world has been crucified to me and I to the world" (Gal. 6:14). ‘I have counted all as loss for the sake of Christ ... that I may know Him and the power of His resurrection and the fellowship of His sufferings, being conformed to His death; in order that I may attain to the resurrection of the dead’ (3:7,10-11). ‘The children of this age marry and are given in marriage, but those who are considered worthy to attain to the age to come and the resurrection from the dead, neither marry, nor are given in marriage; for neither can they die anymore, for they are like the angels, and are children of God, being children of the resurrection.’ (Luke 20:34-36). By their very existence and way of life, monks and nuns are proclaiming and bearing witness to the reality of the resurrection promised by Christ. Otherwise, if this life is all there is, their lives make no sense.